Cut the mozzarella and sundried tomatoes into pieces and place them around the edges of the pizza dough. Fold the edge of the pizza dough over them, then form 2 points at either end. 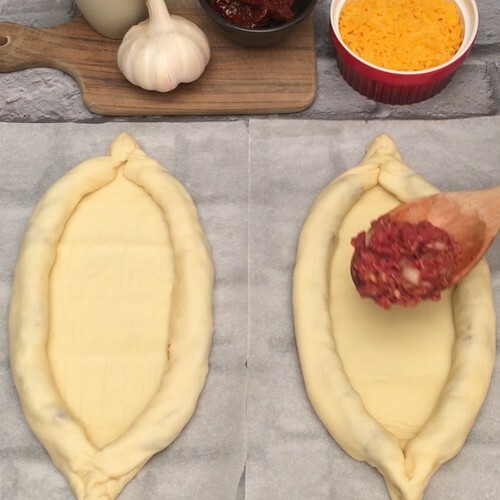 Finely chop the onion and garlic and mix them with the mince, tomato sauce, salt and pepper and fill the middle of the dough with the mix. Sprinkle with the grated cheddar and break an egg in the middle. Bake for 25 minutes at 180°C on a baking tray. Garnish with chopped chives and enjoy.